Fresh Produce is braided from chenille yarn (92% acrylic/8% polyester) in 19 different colorways that will enhance any room. A blend of cotton and synthetic fibers makes up the core fill of this true flat braid. Chenille creates vibrant colors and good resiliency under normal, moderate use. Not recommended for stairs or high traffic areas. 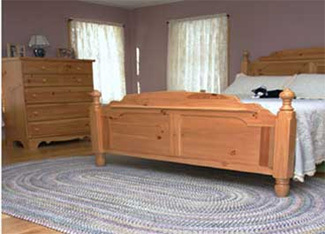 All chenille products do produce some shedding, with no effect on the long-term performance of this rug.